It’s time to go online to make your business more visible. Now, Google is offering free websites to SMBs (Small and medium businesses) in India. 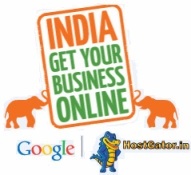 It will provide free domain with .in extension and hosting services for one year powered by HostGator. Typically, a domain registration costs 10 $ and hosting costs 100$ for one year to SMBs. Moreover, they may not be familiar with web designing and its strategies. So Google has launched “India Get Your Business Online” program to break down these barriers and is helping small Indian businesses to get online – By offering easy and free tool to set up and host a website. How does it work to raise your business growth? As you are publishing your business over internet, it helps customers to reach your place more easily. Also, website will serve your clients on 24/7 basis by providing an interface to make deals or orders. It is a gate way to get new customers. It will give power to compete your world. Lastly, your site will be targeted over Google Search in your business location. How will I get free website? It is simple to follow some easy steps to get professional website. 2. Name your Domain that you want to register and click on “Next”. 3. Fill up a form of business information. Here you have to furnish your address, phone number, TAN/CIN or PAN to verify you as a business and click on “Next”. 4. An automated mail will hit your inbox. It contains instructions how you login to the control panel. After logging to Control panel you can customize and publish your website. Here is my Business Website. Check it. Are you going to register your biz website? - If you have any query, post a comment.